Our pour-molded, embossed, soft flexible custom PVC rubber labels, custom patches and custom emblems sew easily onto all types of fabrics. The PVC, rubber or silicone labels will not perforate, unravel, chip or peel off unlike embroidery and silkscreen. Each sewing label is custom-made. We offer silicone labels and patches as well. Our ability to achieve detail and not alter your design is an important benefit. And we do not have to go “big” to get the detail like other processes do. We decorate on site and can sew anything, fast, no minimums onto hats, bags, shirts, jackets, and difficult to decorate items. We also can use heat seal and adhesives if sewing is not possible. We offer eco-friendly emblems made with recycled PVC rubber material. Our recycled emblems and rubber flexible labels are a good fit for your green oriented customers. Coming soon we will offer our corn plastic labels and products. Our custom emblems are medical grade and non-phthalate PVC patches. Please look at the Flex 4CP patent pending labels and products on our website. 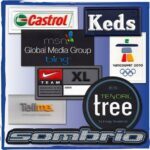 Whether its sewing rubber labels, silicone patches, plastic labels, a rubber emblem or a rubber patch, Prop 65 compliant PVC labels, eco-friendly emblems, debossed or embossed PVC labels, four-color process labels, rubber flexible labels, promotional PVC labels and rubber patches, we can do them for you. Our custom rubber labels are made to last and we are popular in many industries from fall protection, to scuba dry suits and buoyancy compensators labels that are heat sealed, to name plate labels, motocross and other outdoor industries. Our phthalate free PVC rubber patches and rubber labels are Prop 65 compliant. An independent lab has tested our USA products, click here for the SGS report. Our Orient suppliers are also compliant and we have their SGS certificates as proof. It has no ingredients that are on the PROP 65 watch list. And we meet all consumer safety laws regarding the PVC, lead, cadmium, etc. Ask us about our variable data labels as well as our braille labels. Made in the USA. A Unique Alternative to Silkscreen or Embroidery – TRY SOMETHING NEW! Shipping Weight: Approximately 20 pounds fo 500, 2” parts.